Hiroshima is one of the most famous cities in the world. The tragic occasion, that it became notorious for, will hardly ever fade away. Hiroshima continues forward, though, emerging as an increasingly preferred destination and a place where memories intertwine the past, with modern entertainment venues and the unique flair of Asian culture and traditions. The city was founded more than four centuries ago. It is near the delta of the Inland Sea, in 1589. One year later, in the newly established town raises majestically one of the biggest attractions in the Japanese city - the Hiroshima Castle. It is situated on the river Otagawa. Some religious shrines actually began the formation and development of the city. For centuries, the castle serves as a centre and a major landmark in Hiroshima. Unfortunately, after several centuries of history, the beautiful building did not survive after the bombings of World War II and in 1945 was almost entirely destroyed. Just a few years later, however, the Japanese built it anew. Today a memorial replica castle is considered one of the biggest attractions of Hiroshima. The castle houses a modern museum telling the history of the city until the Second World War. The fee for access to the temple is 360 yen. The official symbol of the city is the flower oleander. Stories tell that this was the first plant to grow here after the disastrous destruction of the August 6, 1945. The city proves daily that it has the power and resources to rise from the ashes. There are constantly new buildings and very modern shopping centers, as well as office buildings. The infrastructure expands, as the quality of life is slowly scaling up. Today, the more than one million strong city deserves respect and admiration for the buildings and parks that are revived, having in mind that after the atomic bomb nearly 70% of buildings in Hiroshima were completely destroyed and 7% of them were partially collapsed too. One of the symbols of the city is the Peace Memorial Park in Hiroshima, where the peace museum opened in 1955. The park is situated in the central Japanese city, just 15 minutes from Hiroshima Castle. The open space is marked at 120 thousand square meters. The Peace Park is a kind of oasis in the heart of the city, where among the trees, paths, pleasant atmosphere and interesting monuments you can relax from the hectic pace of modern Hiroshima. Before the atomic bomb on the territory of this park were rising in government buildings and financial institutions. Of great interest to guests of the city is the Peace Memorial Museum. It consists of two buildings where photographs tell the story of human suffering caused by dropping the atomic bomb over the city. The park is located around the half-destroyed monument called the A-Bomb Dome, whose skeleton is also reminiscent of the destruction during and after World War II. This is one of the few buildings that remained after the bombing ruined. The monument was designated by UNESCO as a World Heritage site. In contrast to the tragedies that happened in 1949, the Japanese Parliament determined Hiroshima as the City of Peace. The vision and ideology of the local population follows the postulates of peace and understanding. Today the Japanese city is a cultural hot spot, where at world conferences are born and developed social causes, whose main goal is the elimination of nuclear weapons. Hiroshima has created a new image of an economic, political, financial and cultural centre of western Japan. The main pillars of the economy in Hiroshima are automotive. There is also the world-renowned museum of Mazda. In the field of technology today, the city develops many other innovative companies in Hiroshima, some of whom occupy top positions in their markets. Many believe that the city is a better place to live than other developed cities like Tokyo, Osaka, Kyoto or Fukoka. The reason for this is the reasonably priced life in the Japanese city. Hiroshima is home to many art museums, where visitors can see fine works of art from antiquity to today. If you decide to visit Hiroshima in early May, you will be pleasantly surprised by the annual Flower Festival. Thevivid celebration is held from 3 to 6 May and has enjoyed more than one million participants each year. Fans of green spaces can do to enjoy the beautiful Shukkeien Garden, where an a relatively little space grow a wide variety of botanical species, in real or miniature sizes. The garden has a long history. Established back in 1620, it is located near Hiroshima Castle. Japanese Botanical Park is adjacent to some interesting tea houses, where visitors can observe the characteristic tea ceremony. Hiroshima is a noisy and colourful centre. The most popular and lively street is called Hondori Street. This is a pedestrian zone, packed with shops, restaurants and entertainment venues. Starting at the Peace Park, it stretches about a kilometre to the east. Connoisseurs of Japanese cuisine will be able to eat a traditional dish of Hiroshima called okonomiyaki. This is a pancake that has a variety of products including cheese , seafood, mayonnaise and spices. 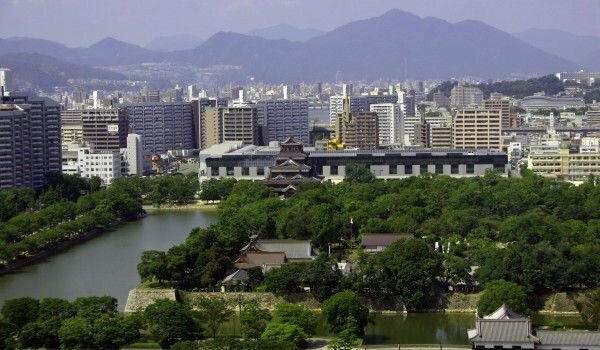 The Japanese city is located in the Hiroshima prefecture and is actually its capital. It is the largest settlement in the Chugoku area, located in the western part of the country.